Then you already know that one of the biggest challenges for the horse owner is maintaining healthy hooves! Horses are very susceptible to all kinds of hoof ailments, most of which are very common. And of those, a good many (if not most) are caused by bacterial and/or fungal infections, of one kind or another. Does Your Horse Suffer from a Hoof Disease or Condition? Is your horse suddenly lame? Is there unusual swelling in the lower limbs? Is the hoof warm to the touch? Is your horse unwilling to put weight on one hoof? 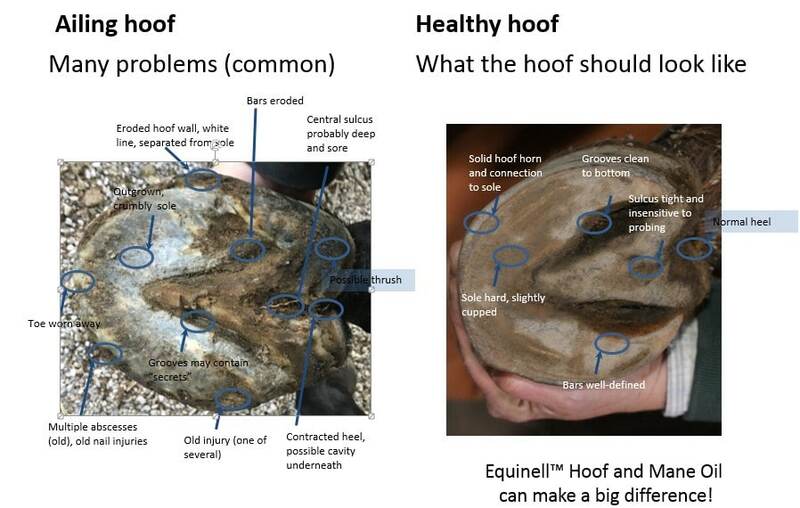 Are there signs of damage to the hoof sole? Looking at the sole of your horse’s hoof, locate the “white line” – the whitish looking area between the outside hoof wall and where it meets the sole. Scrape or brush it until it’s clean. Evaluate the width (It should be about the width of a line drawn with a pencil). Does the line appear to be “stretched”? Or is there a crack or separation? Long wide spots are likely to be current infections – white line disease. What You Need to Do RIGHT NOW! Hoof infections can range from mild to life-threatening! If you suspect your horse may have a hoof infection, YOUR FIRST MOVE is to call your veterinarian or farrier ASAP and have your horse examined by an expert. Follow his/her advice, and hopefully your horse’s condition will improve over time. Depending on the seriousness of the condition, this could take a few days, to several months. Whether your horse currently has healthy hooves, or has recovered, or is recovering, from a hoof disease, observe the following tips to keep your horse’s hooves healthy. Good diet – grass hay, fed continuously off the ground, is a good start. Keep your horse outside as much as possible. Try to keep his pasture drained. If you must stall, keep the stall as clean as possible. If your horse’s hoof problems are the result of a bacterial or fungal infection, Equinell™ Hoof and Mane Oil can be of ENORMOUS help! Application of Equinell™ on a regular basis as directed, can not only help to protect your horse from the onset of hoof problems, but can even be a factor in improving the comfort and appearance of affected areas during the recovery process. There are numerous products on the market that purport to be effective in addressing hoof aliments. But we believe that the results of using Equinell™ surpasses ALL of those products… BY FAR! This is an amazing product. Truly a gift to the horse world. Thank you! 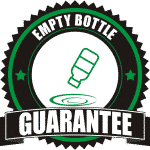 In fact, we believe so strongly that we’re willing to offer a FULL, Unconditional, No-Questions-Asked, MONEY BACK GUARANTEE! 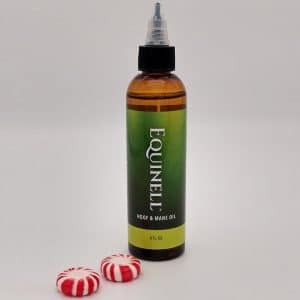 Try Equinell™ Hoof and Mane Oil RISK FREE! Many horse owners have used Equinell™ for hoof problems, and have been AWED by the results!… and YOU WILL BE TOO… GUARANTEED! My horse Charlie had thrush on three hooves. We used Equinell on him and it fixed him right up! Thank you so much Equinell! My entire life I have attempted to help horses in any which way I can, and your product is an important milestone to hoof health, one of the most overlooked and misunderstood areas, even for vets and farriers. product YOU HAVE EVER TRIED! Try it on YOUR horse, and if you don’t agree, just return the unused portion for a FULL, No-Questions-Asked refund! Einan came to Legacy Farm with an advanced case of thrush. He was noticeably uncomfortable. After four Equinell hoof oil treatments the smell has vanished there is no more exudate and he is much more willing to let us work on his hooves. P.S. if you’re serious about addressing your horse’s hoof problems… and we’re sure you ARE… or you wouldn’t be reading this… then there’s no reason to put it off another moment! Go ahead! – Get Equinell™ for your horse NOW! Our No-Questions-Asked, Money-Back GUARANTEE makes this a “No-brainer”!